In the Genes unit students learn the structure of the chromosome and identify the consequences of a base substitution mutation. Genetics is the storage of information and how this information can be passed from parents to progeny. Genes are make up of DNA, few DNA molecules in a cell (just 46) but there are 1,000’s of genes. From this we know that each gene consists of a much shorter length of DNA than a chromosome and that each chromosome carries many genes. 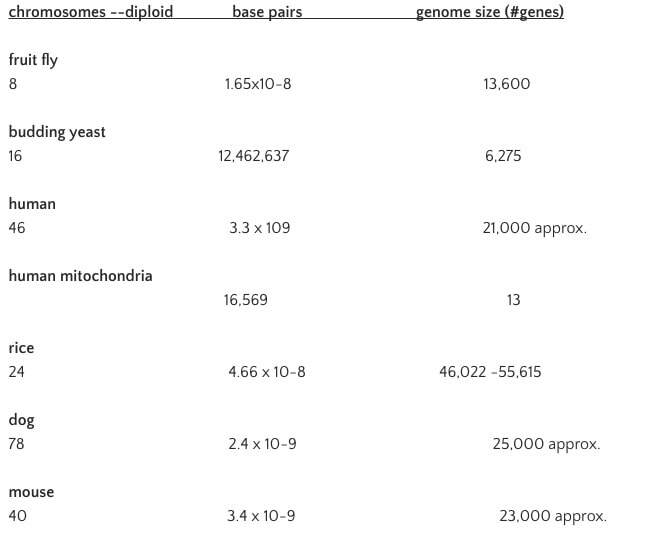 ​3.1.U2 A gene occupies a specific position on a chromosome. Usually different alleles of the gene vary by only one to a couple of different bases. For example, the allele for Sickle Cell Anemia is created by a mutation of a single nucleotide. Adenine is switched to Thymine (CTC to CAC) which results in glutamic acid being substituted by valine at position 6 in the Hemoglobin polypeptide. ​3.1 U5 New alleles are formed by mutation. A gene mutation involves a change in the nucleotide sequence of DNA and is the ultimate source of genetic diversity. New alleles are created by random changes in the base sequence called mutations. These changes can either be neutral or harmful, lethal – cause the death of the cell in which the mutation occurs. The genome is the totality of genetic information of a cell, organism or organelle. This includes all genes as well as non-coding DNA sequences (e.g. introns, promoters, short tandem repeats, etc. The whole of the genetic information of an organism's genetic information is contained in DNA, therefore a living organism’s genome is the entire base sequence of each of its DNA molecules. Genome of the prokaryotes is much smaller and has the DNA in the circular chromosomes, plus any plasmids that are present. A mutation that causes the replacement of a single base nucleotide with another nucleotide in DNA. When one of the bases is changed, this will cause a change in the mRNA sequence when the DNA is copied during transcription of the gene. This change in the mRNA sequence may change the amino acid in the polypeptide coded for by the gene; in the process of translation. Sickle-cell anemia is a disease that causes red blood cells to form a sickle shape (half-moon). These sickled blood cells cannot carry as much oxygen as normal red blood cells. They can cause clots in blood vessels because of their abnormal shape and inflexibility caused by crystallization of the abnormal hemoglobin. Sickle cell is caused by a base-substitution when the adenine base in GAG is replaced by a thymine base, changing the triplet to GTG. The normal triplet when transcribed and translated codes for the amino acid glutamic acid. When the base substitution occurs, the amino acid that is translated is now valine. Since valine has a different shape and charge, the resulting polypeptide’s shape and structure changes. As a result, hemoglobin’s shape will change, as does the shape of the red blood cell, resulting in the problems associated with sickle cell anemia listed above. ​​​​​​​​Correct use of terminology is a key skill in Biology. It is essential to use key terms correctly when communicating your understanding, particularly in assessments. Use the quizlet flashcards or other tools such as learn, scatter, space race, speller and test to help you master the vocabulary. Click here for additional information on HOW GENES WORK. ​There is a link between sickle cell anemia and prevalence of malaria. How can we know whether there is a causal link in such cases or simply a correlation? ​Epigenetic inheritance is really weird, but is it real? ​Animated and narrated segments presenting all the essential steps in sequencing a genome. From the NHGRI's Online Education Kit: Understanding the Human Genome Project. ​Your genome, every human's genome, consists of a unique DNA sequence of A's, T's, C's and G's that tell your cells how to operate. Thanks to technological advances, scientists are now able to know the sequence of letters that makes up an individual genome relatively quickly and inexpensively. Mark J. Kiel takes an in-depth look at the science behind the sequence.